all your sent faxes are available in your sent mail folder. 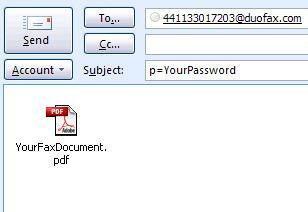 simply address your email to the recipient's fax number followed by "@duofax.com"
you can use commonly used file types such as DOC(x), XLS(x), TXT, PDF, JPG, BMP, TIFF, HTML etc. you can also use our special fax program at any timewhich will enable you to fax any document + will offer you additional benefits. See also how you can send faxes with our fax program or from DuoF@X web portal.